Microsoft outlook does not provide any facility to directly split large pst file into small pst file. 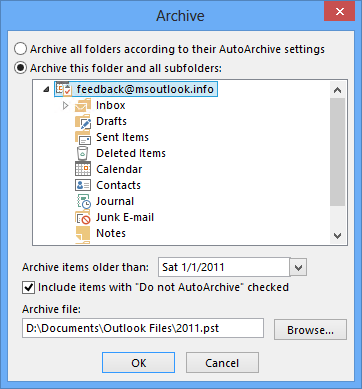 User can user Archive feature in Outlook to Split large pst-file into multiple small files by yearly Archive. User can run the Archive process multiple times, each time to a new pst-file. This splitting process can be done via Archive feature in Outlook. By archive feature you can split your files for quarter year, one year or for two year as per your requirement. For splitting file you must configure Outlook to archive based on the Received date inspire of the Modified date. So that you can prevent emails which have been modified or received after your archive date from rest of your .pst-file. Open the Archive dialog box. After that click on the top level folder to select the entire mailbox in spite of the currently selected folder. Now set the “Archive items older than:” you can choose date to the 1st of January of the year after you want to create your first archive for. For example if you want to create your first archive folder for 2011 and previous, set the date to the 1st of January 2012. Include items with “Do not Auto Archive” checked. Now specify a name and a location for your .pst-file for 2011 and previous year. Make sure that this is a location of your local computer and all your network sharing is off at the time of archiving. You can use the Archive feature to split your large .pst-file into small files. Once you’re done with creating yearly archives, you may notice that your original .pst-file still has a large size. Reason is very simple a .pst-file is a database and, for performing operations, space freed up by removed item. This space is directly being returned to the file system after operation. This space is called “white space”. Microsoft Outlook automatically return this “white space” when a certain amount of it exists in a .pst-file (outlook can be use up to 15 percent) and the computer is idle. After starting this process manually you can use compact now button to return this “white space” as free space on your disk drive. Size of your .pst has been decreased. Also make you can include these newly created .pst-files in your backups. Because you are no longer add or remove data to these pst-files. You need not to include them in your daily backup’s files and so this back up data will save your time and space. This is effective and powerful software you can instantly reduce the oversize PST files without losing original any data. Split large Outlook PST files into smaller for make fast accessibility. Because many times user become unable to access their Outlook data due to over-sized. By using this tool user can easily split any size of PST files into smaller files. For further details you can visit here :: Split PST File using Manual Techniques. Splitting the large size PST file into small parts by using this third party tool http://www.undeletepcfiles.com/split-pst-file.html and easiest way to split your large size PST file according to date, year, size and email ID. There are an other affordable and cost effective software to split large size PST files into small parts. This remarkable software help the users to work with many versions of MS Outlook as well as it is compatible with different versions of Windows. Facing split PST files problem is not a big issues. If you want to split heavy PST files. then I would suggest to kindly refer this given link: http://www.splitpsttool.net By reading this tool, I assure that you will be able to resolve all sorts of split PST corruption or damaged issue without facing any difficulty. I would like to mention an excellent tool www.pst-splitter.com to split your large size Outlook PST file into small parts according to date, size and sender email id basis. The software is also well supported by every versions of MS Outlook and all latest Windows OS. When the user wants to split large PST file into multiple PST files format and MS Outlook doesn’t give the option to split. Then I suggest you to use free solution which can easily and securely split oversize PST files. Check the free splitting solution, here:- Split large PST file into multiple PST files. Split large PST files into small manageable parts is the best option to reduce the error from PST file. There are many techniques available over the internet market to split the PST file. Split your over-sized Outlook PST file using professional to break PST file into smaller parts; Split PST file Software. By using this option, you can easily create multiple PST files free of cost.